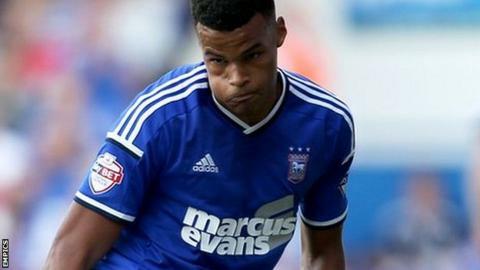 Ipswich Town full-back Tyrone Mings says manager Mick McCarthy's calmness is benefitting the players as the Tractor Boys close in on the play-offs. Town go into their penultimate game of the season in sixth, three points clear of nearest challengers Brentford. "Everything the manager does is always very measured," Mings, 22, said. "He's a very good man to be around, because he's the same as he was in his first week here, and will be in the last week he'll be here." Released by Southampton as a 16-year-old, Mings signed for Ipswich in the summer of 2013 from non-league Chippenham Town. He has impressed during his first full season in the Championship and is reportedly being watched by a host of Premier League clubs, including Arsenal. And he said it has been a valuable learning experience, on an off the field. "Physically I'm fine. Around Christmas it was quite tough and mentally draining, but I've come through that and enjoyed every minute, the ups and the downs, the praise and the criticism," Mings told BBC Radio Suffolk. "I think I've learned about my own game, about the Championship, about what it takes to win games, I think I've come on." Joined Southampton as an eight year-old in 2001, but released in 2009. Went into non-league football after leaving school, signing for Yate Town. Moved to hometown club Chippenham Town in 2012. Signed for Ipswich after successful trial a year later. Made professional debut on final day of 2012-13 season at Burnley. Scored first senior goal in February in Ipswich's 4-2 win over Birmingham City. As well as paying off family debt and donating match tickets to fans, Mings also made headlines for working with the homeless on Christmas Day and paying for replacement shirts when he was given a new number after Aaron Cresswell moved to West Ham. Mings has also won plaudits for his generosity, giving match tickets for supporters and paying his mother's debts. "I think everyone's dream, isn't it, to give their parents an easier life?" he said. "It was definitely a little bit naive to put it out there on [social media] and not expect it to get picked up like it did. "If giving something back is seen as a news story, fine, but I don't really see it that way. Others do it and it goes under the radar, some players do a lot for charity." Victory against Nottingham Forest on Saturday would virtually guarantee Ipswich's place in the play-offs and Mings is confident McCarthy's leadership style will enable him to maintain his form. "He and [assistant manager] Terry O'Connor have done everything I could have asked for, they've given me my chance on the pitch and looked after me off it too," he said. "The manager is very quick to put his arm around me if something hasn't gone my way - he knows I'm still learning but he's very good at taking any stick that's going - he's taught me a lot in terms of defending too. "It would be ideal if we can be secure going into our last game, but we won't be thinking beyond winning the game against Forest."